People often ask about adding a bulbous bow to their boat, usually in the interest of increasing fuel efficiency. My usual answer is that it’s probably not going to do any good, and it’s likely do harm. The chances of adding a useful bulb is really small unless an owner is willing to undertake an extensive tank testing program. This is because the effective operating range (speed) for any bulb is quite small, more on this further down. Bulbs can be added for at least 4 separate reasons. 1) Reduced Resistance. The position and volume of a bulb can reduce or change the shape of the bow wave. 2) Change Motion. It can affect seakeeping by reducing pitching and lifting the bow clear of steep seas. 3) Change Trim. The presence of a bulb pulls the LCB forward and can add positive (bow up) trim. 4) Add Volume. The bulb can increase underwater volume (displacement) for tanks or machinery. 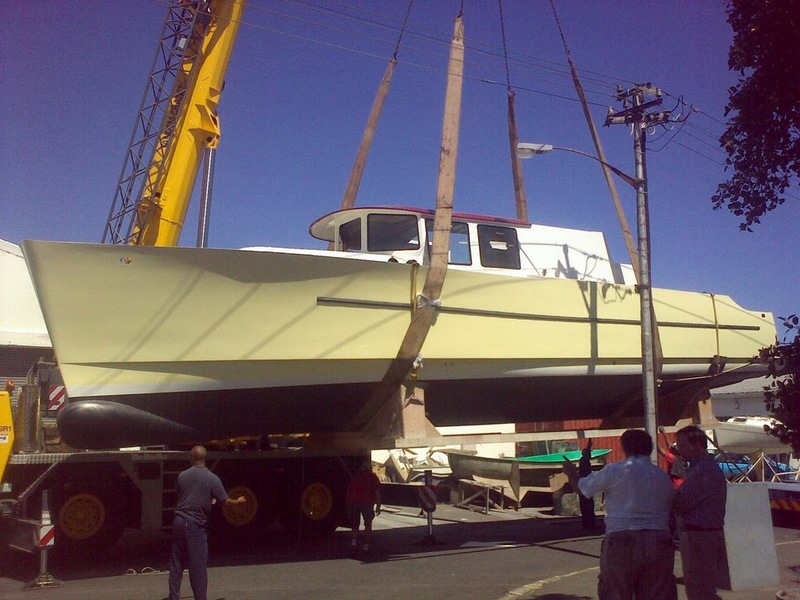 Above is a picture of the Passagemaker Lite 46plus on her way to launch in South Africa. Her bow bulb is of the heart shape or Nebula form. In section it’s pointed on the bottom so it does not bang when re-entering the wave. And it’s full and flatter on top to add volume and resist lifting out of the water easily. How it will work is yet unknown. We’ll find out once the boat gets her engines operational and undertakes a cruise. I have hopes but being a bit pessimistic the bulb is an add-on of foam and fiberglass and can be ground off if it’s a problem. One of my concerns with these designs is that the arrangement pushes the main fuel tanks forward in the boat. To offset that forward weight I added the bulb, hopefully bringing LCB forward without adding significantly to drag. My attention to the bulb problem was raised this morning with news that Maersk is retrofitting 10 container ships with new bulbs (replacing the existing ones) to save fuel. These container ships were originally designed around cruising speeds of up to 24 knots. Today Maersk (and most other container lines) have implemented “slow steaming” for container ships, mainly to save on fuel burn in view of very low worldwide shipping rates. This means hulls (and their bulb shapes) designed for 24 knots are now operating at only half that speed. The high-speed bulbs are enough of a detriment that it pays to put the ship in drydock and build a new shaped bulb for the lower speed.